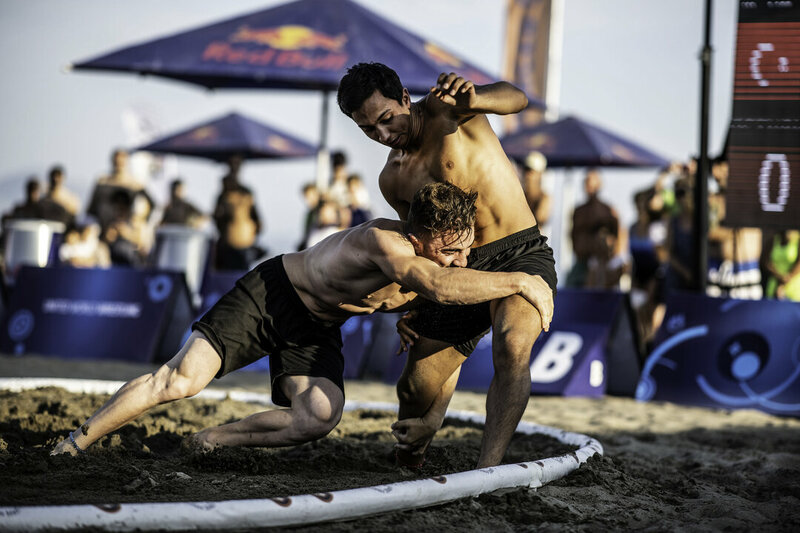 SARIGERME, Turkey (October 6th and 7th) -- Beach Wrestling is known for being a fast paced and exciting style, it is always a favorite amongst competitors. On the line this weekend is a world champion title and qualification to the 2019 Beach Games in San Diego next summer. Here is a quick guide to better understand the action when it hits the beach this weekend. 3 points wins the match. If there is a tie at the end of the match then the winner is decided by the highest value of holds, last point scored, weight of competitors (lighter taken the victory) or the lost number pulled during the drawing of lots. Catch all the action live on United World Wrestling! CORSIER-SUR-VEVEY (February 26) – United World Wrestling, the international federation for the sport of wrestling, has confirmed plans for an ambitious worldwide tour of Beach Wrestling, the organization’s fastest growing new discipline. The 2019 Beach Wresting World Series will launch in late March and include four stops around the globe. In addition to sun-drenched beaches and high-flying competition, the series will feature equally attractive cash prizes totaling 15,000 CHF per event. Each weight category will be awarded a total of 1750 CHF; 1000 CHF for gold, 500 CHF for silver, and 250 CHF for bronze. To incentivize crowd-pleasing techniques, fans in attendance will also be asked to vote on the “Big Move from the Beach,” – an award that comes with an additional 1000 CHF for the winner. The Beach Wrestling World Series kicks off in the historic town of Chaves, Portugal on March 29-30 before quickly moving to Olympic Park in Rio de Janeiro, May 11-12. Wrestlers at the first two Beach Wrestling World Series event will also earn points to qualify for the 1st ANOC World Beach Games, scheduled to take place this October in San Diego. The third stop of the world series will head to Odessa on August 9-10, before wrapping up at the Beach Wrestling World Series Final in Zagreb, September 6-9. The Beach Wrestling World Series will follow a pool format with each wrestler competing against every wrestler in the pool to determine who will compete for the gold and bronze. Weight classes for the Beach Wrestling World Series are below. National federations are reminded that they are limited to three entries per weight category. Follow our new Instagram account at www.instagram.com/uwwbeachwrestling and on Twitter @uwwbeach.